Purpose To assess the prevalence and severity of preoperative and postoperative astigmatism in patients with cataract in the UK. Setting Data from 8 UK National Health Service ophthalmology clinics using MediSoft electronic medical records (EMRs). Methods Eyes from patients aged ≥65 years undergoing cataract surgery were analysed. For all eyes, preoperative (corneal) astigmatism was evaluated using the most recent keratometry measure within 2 years prior to surgery. For eyes receiving standard monofocal intraocular lens (IOLs), postoperative refractive astigmatism was evaluated using the most recent refraction measure within 2–12 months postsurgery. A power vector analysis compared changes in the astigmatic 2-dimensional vector (J0, J45) before and after surgery, for the subgroup of eyes with both preoperative and postoperative astigmatism measurements. Visual acuity was also assessed preoperatively and postoperatively. Results Eligible eyes included in the analysis were 110 468. Of these, 78% (n=85 650) had preoperative (corneal) astigmatism ≥0.5 dioptres (D), 42% (n=46 003) ≥1.0 D, 21% (n=22 899) ≥1.5 D and 11% (n=11 651) ≥2.0 D. After surgery, the refraction cylinder was available for 39 744 (36%) eyes receiving standard monofocal IOLs, of which 90% (n=35 907) had postoperative astigmatism ≥0.5 D and 58% (n=22 886) ≥1.0 D. Visual acuity tended to worsen postoperatively with increased astigmatism (ρ=−0.44, P<0.01). Conclusions There is a significant burden of preoperative astigmatism in the UK cataract population. The available refraction data indicate that this burden is not reduced after surgery with implantation of standard monofocal IOLs. Measures should be taken to improve visual outcomes of patients with astigmatic cataract by simultaneously correcting astigmatism during cataract surgery. Large, longitudinal real world studies describing astigmatic patients undergoing cataract surgery are needed to inform the potential requirement of simultaneous correction of astigmatism during surgery. The principle aim of the present study was to address this knowledge gap by determining the prevalence and severity of preoperative and postoperative astigmatism in a large, real world population of eyes with cataract in the UK. An exploratory objective was to describe the effect of postoperative residual astigmatism on patients’ VA.
A total of eight cataract clinics was selected based on the number of cataract surgeries (proxy for final cohort sizes), time of EMR adoption (estimate of historical data available), geography (to ensure representativeness) and visual assessment recording (to ensure consistency of outcome reporting). All patient data extracted, processed and analysed for this study were fully anonymised and compliant with the UK NHS rules governing use of patient-level healthcare data (as defined in the Data Protection Act of 1998). Anonymised database analyses of this type do not require ethical permission as they are viewed as audit or service evaluation.13 This study was approved by the participating NHS centre’s Caldicott Guardian. All the analyses were performed at the eye level. Data were extracted for eyes with a first record of phacoemulsification of the lens and implantation of a prosthetic intraocular lens (IOL) (cataract surgery) between 1 January 2005 and 1 January 2015. Eyes were followed from the date of cataract surgery for up to 12 months and were required to have a valid record of preoperative keratometry cylinder (taken from biometry), used for estimating the magnitude of corneal astigmatism (dioptres). In attempts to exclude secondary types of non-age-related cataracts, eyes from patients aged less than 65 years on the date of first cataract surgery were not included in the analyses. In addition, eyes were excluded if they had any co-surgeries performed at the time of cataract surgery or repeat surgeries following cataract surgery (cases where intraoperative surgical adjuncts such as use of iris hooks, opposite clear corneal incisions (OCCI), capsular tension ring and performing limbal relaxing incisions (LRIs) were included). Finally, as only a small number of eyes (N=92, 0.1% of total eyes) were implanted with toric IOLs, these were included in the population description but excluded from postoperative analyses. No imputation of data was performed. Preoperative astigmatism was described using keratometry (corneal astigmatism). The most recent cylinder measures within the 2 years prior to cataract surgery were used. Astigmatism is with-the-rule (WTR) when the corneal curvature is steepest in the vertical meridian; conversely, astigmatism is against-the-rule (ATR) when the steepest corneal meridian is horizontal.14 In this study, using the positive cylinder, corneal astigmatism was defined as WTR when the steepest meridian was 90°±30° and ATR when it was between 1° and 30° or 150° and 180°, inclusive; all the rest (ie, steepest meridian >30° and <60°, or >120° and <150°) were considered as oblique astigmatism.15 Incision axis was available in degrees within the EMR. When the steepest meridian for astigmatism was not recorded, the astigmatism type was defined as unknown. Corneal topography was not available and thus regularity of astigmatism was not included in the study. While keratometry is a required assessment prior to cataract surgery, refraction is used more frequently to measure astigmatism following surgery. In this retrospective study, auto refraction and subjective refraction records were used to describe postoperative astigmatism in eyes with the most recent refractive measure recorded between 2 months and 12 months inclusive after cataract surgery. This was to ensure that stable refraction measures following cataract surgery were evaluated. The results were stratified by presence of co-pathologies and by surgery performed on the steepest meridian (defined as the main corneal incision axis falling within ±15° from the corneal astigmatism steepest meridian). All other surgeries were considered ‘off the steepest meridian’. For the prevalence analysis, astigmatism was defined as cylinder ≥0.5 D. A power vector analysis was performed to evaluate how this pre-existing astigmatism changed following cataract surgery with implantation of standard monofocal IOLs. To describe this change, the corneal and refractive astigmatism of eyes with ≥0.5 D preoperative astigmatism were converted from cylinder into vector notations. Eyes which did not have both corneal and refractive axis and cylinder recorded prior to and following cataract surgery were not included in this analysis. When using power vector analysis, multivariate statistics can be applied to compare population means and variances of directional measures such as astigmatism.16 In this study, the preoperative and postoperative J0, J45 vector values were compared using the unadjusted paired Hotelling’s T2 test. A multivariate linear regression analysis was also performed to adjust for potential confounders such as the steepest meridian of surgery and presence/absence of any co-pathology. VA was determined in terms of uncorrected distance visual acuity (UDVA) and best-measured distant visual acuity (BDVA), defined as the best measure out of corrected distance VA, UDVA and pinhole VA.20 Only the most recent UDVA and BDVA measures between 2 months and 12 months following cataract surgery were used to ensure vision stability. Postoperative UDVA and BDVA were expressed in logMAR Scale and were also converted to the Snellen Scale for presentation purposes. The results were stratified by presence/absence of any co-pathology and by the steepest meridian of surgery. In order to describe the effect of postoperative residual astigmatism on postoperative UDVA, the correlation between UDVA and refractive astigmatism was analysed using Spearman’s correlation coefficient (ρ) with significance set at P<0.05. Astigmatic eyes with preoperative astigmatism ≥0.5 D and with postoperative refraction and UDVA measurements recorded within 2 months and 12 months after surgery, were analysed. A sensitivity analysis was performed in a population of eyes without co-pathologies and intraoperative or postoperative complications and with postoperative spherical equivalent ±0.25 D and ±1.00 D to exclude potential external factors (other than astigmatism) that may impact VA.
Postoperative UDVA at different levels of astigmatism severity was also explored and presented using a box plot. Astigmatism severity was defined according to Lyall et al (2014),3 as follows: mild when cylinder is <1.5 D, moderate when the cylinder is between 1.5 D and <2.5 D and severe when it is between 2.5 D and <5.5 D. Eyes with ≥5.5 D were considered as potentially pathological corneas. All analyses were performed using SAS software V.9.4. After applying the selection criteria, 110 468 eyes from 76 910 patients were identified (figure 1). A total of 43 352 patients (56%) had one eye operated and 33 558 (44%) had two eyes operated within the study period. Population selection and attrition for eyes included in the study population. IOL, intraocular lens; UDVA, uncorrected distance visual acuity. The study population had a mean (±SD) age of 79 (±7) years and the majority of the included eyes (N=70 094, 63%) did not have ocular co-pathologies (table 1). A small proportion of the included eyes recorded intraoperative (N=2608, 2.4%) or postoperative (N=3642, 3.3%) complications during the 12 months follow-up. Preoperative keratometry was described for all 110 468 eyes. Presurgery, the average corneal cylinder power was 1.06 D at a steepest meridian that in most eyes (N=46 999, 43%) was oriented ATR, in 31% eyes (N=33 878) was WTR and in 17% eyes (N=18 826) was oblique. In 10 765 eyes (10%) the steepest meridian was unknown (table 2). Overall, 78% (N=85 650) of the study eyes presented at the NHS clinics for cataract surgery with preoperative corneal astigmatism ≥0.5 D; 42% (N=46 003) had ≥1.0 D and 11% (N=11 651) had ≥2.0 D (figure 2, solid line). Figure 3A shows the distribution of astigmatism levels across the different astigmatism types. There was a lower proportion of eyes with corneal astigmatism ≥0.5D, ≥1.0 D and ≥2.0 D in the group of eyes with oblique astigmatism (66%, N=12 369; 25%, N=4695; 5%, N=882, respectively) compared with those with ATR (81%, N=38 069; 48%, N=22 438; 13%, N=5916) and WTR (79%, N=26 767; 42%, N=14 291; 11%, N=3678) astigmatism. However, the proportion of eyes with oblique astigmatism was smaller than those with WTR and ATR. Distribution of preoperative (corneal) (solid line) and postoperative (refractive) astigmatism (dashed line). The preoperative population includes all eligible eyes (N=110 468), while the postoperative population contains all eyes with monofocal intraocular lens (IOLs) and an eligible refractive measurement (N=39 744). Distribution of preoperative (corneal) astigmatism according to type (A) and the distribution of postoperative (refractive) astigmatism according to co-pathology (B). The preoperative population includes all eligible eyes (N=1 10 468), while the postoperative population contains all eyes with monofocal intraocular lens (IOLs) and an eligible refractive cylinder value (N=39 744). Proportions reflect cases exceeding a certain level of preoperative and postoperative astigmatism. On the day of cataract surgery, over 99% of eyes (N=1 10 338) were implanted with monofocal IOLs and the majority (74%, N=81 731) of the surgeries were performed off the steepest meridian. 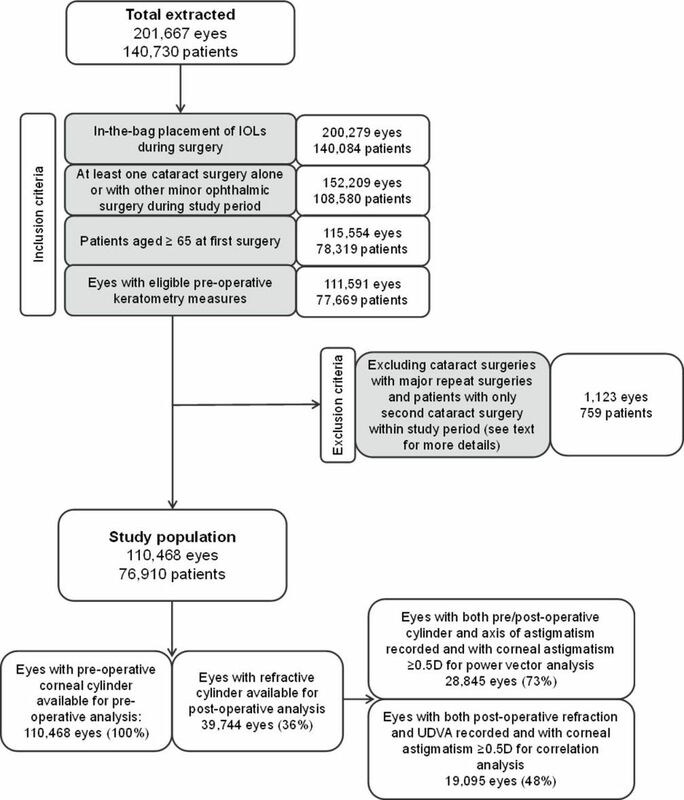 Very few eyes had a record of astigmatism-correction procedures performed during surgery: 92 (0.1%) had a toric lens implanted (excluded from further analyses), 267 (0.24%) eyes received LRI and 196 (0.18%) received OCCI. Measurements of postoperative (refractive) astigmatism were available for a total of 39 744 eyes, accounting for 36% of the study eyes that received monofocal IOLs (figure 1). Of these eyes, 90% (N=35 907) had ≥0.5 D, 58% (N=22 886) had ≥1.0 D and 16% (N=6477) had ≥2.0 D of refractive astigmatism after surgery (figure 2, dashed line). For eyes with or without a history of co-pathologies, the distribution of astigmatism was similar (figure 3B). In order to describe the change in pre-existing astigmatism (≥0.5 D) after cataract surgery with implantation of standard monofocal IOLs, preoperative keratometry measures and postoperative (refractive) measures were converted into the two-dimensional preoperative and postoperative vector (J0, J45). A total of 28 845 eyes were eligible to be included in the analysis (figure 1). In order to visualise the change in astigmatism before and after surgery, figure 4A–C shows the presurgery and postsurgery mean vector values. While the mean J45 value remained near zero both presurgery and postsurgery (−0.016±0.38 D and −0.052±0.40 D, respectively) (figure 4A), the mean J0 value became more negative postsurgery (−0.107±0.63 D vs −0.326±0.57 D, respectively). In the graphs in figure 4, the origin represents an eye free of astigmatism.16 19 Therefore, if the astigmatism is improved after surgery we would expect to see a shift towards the origin. In this study we observed the opposite, suggesting that astigmatism may have worsened postsurgery. The difference between preoperative and postoperative vector values was statistically significant (figure 4A) and was not significantly affected by the presence or absence of co-pathologies (figure 4B). However, the change was significantly associated with the steepest meridian of surgery: the vector (J0, J45) of eyes operated off the steepest meridian was significantly more negative after surgery, than the vector of those operated on the steepest meridian (figure 4C). Power vectors for all eyes implanted with monofocal intraocular lens (IOL) with both refractive cylinder and steepest meridian recorded 2–12 months postsurgery and preoperative astigmatism ≥0.5 D (n=28 845) for (A) all eyes, (B) eyes with and without co-pathologies and (C) eyes operated with and off the steepest meridian. Each point indicates the mean vector value. 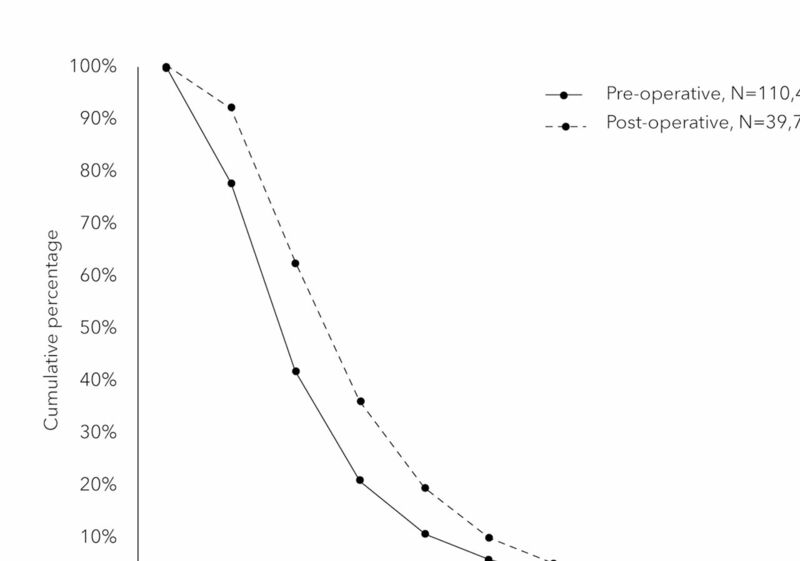 The arrow indicates the direction of change between presurgery and postsurgery (and not the magnitude). The P values represent the result of Hotelling’s T2 test (A) and the multivariate linear regression adjusted for presence of co-pathologies (B) and steepest meridian of surgery (C). Postoperative BDVA and UDVA measures were available for 65% (N=55 268) and 39% (N=33 219) of the eyes implanted with monofocal IOLs and with preoperative corneal astigmatism ≥0.5 D. The average of LogMAR BDVA and UDVA was poorer for eyes with co-pathologies than for those without co-pathologies (table 3; figure 5A,B). Overall, VA was 20/25 (≤0.10 logMAR) or better in only 26% (UDVA, N=8600) and 51% (BDVA, N=28 204) of eyes. UDVA was compared between eyes with and without refraction measures with no difference seen (0.29 vs 0.26 (logMAR)). 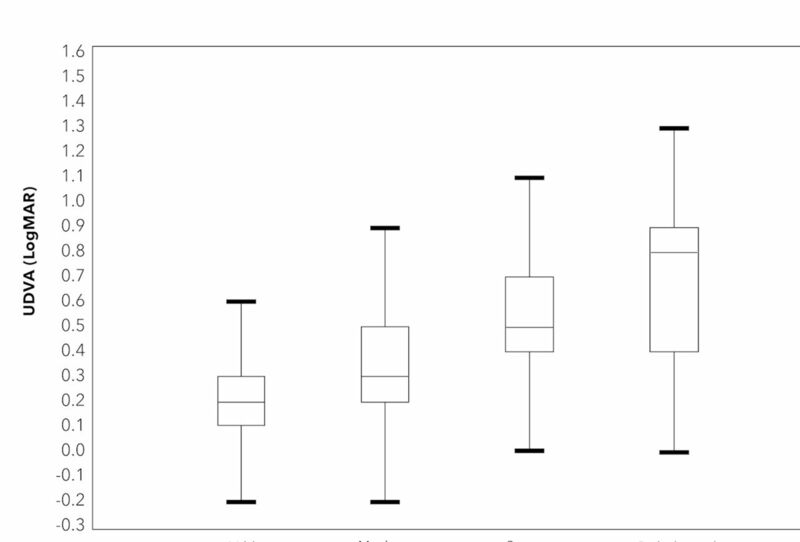 Box plot of UDVA (A) and BDVA (B) scores according to surgery axis and presence of co-pathologies. Note that eyes with preoperative corneal astigmatism <0.5 D were excluded. For 19 095 eyes, both UDVA and refractive astigmatism measures were available postsurgery and were included in the correlation analysis (figure 1). The higher postoperative residual astigmatism was moderately (ρ=−0.44) but significantly correlated with poorer UDVA (P<0.01), suggesting that VA significantly worsens as the severity of astigmatism increases. Figure 6 shows UDVA levels at different categories of astigmatism severity. Uncorrected distance visual acuity (UDVA) levels at different categories of astigmatism severity for eyes with refraction and UDVA measured after surgery (N=19 095). Mild astigmatism:<1.5 D, moderate: 1.5 -<2.5 D and severe: 2.5 -<5.5 D.3 Eyes with ≥5.5 D were considered as potentially pathological corneas. The correlation strengthened, as expected, after excluding eyes with co-pathologies and complications, and limiting to those with postoperative spherical equivalent ±0.25 D (N=4848, ρ=−0.56, P<0.01) or ±1.00 D (N=10 992, ρ=−0.49, P<0.01). It has been reported that mild corneal astigmatism up to 1.5 D can be corrected by operating with the steepest meridian.4 However, cataract surgery with the steepest meridian may be technically difficult and may require less comfortable positioning and therefore it is used less frequently by surgeons.4 This study indicates that surgery off the steepest meridian may have a negative impact on postoperative astigmatism, while those with the meridian did not worsen; therefore, even in cases of milder astigmatism where operating with the steepest meridian is inconvenient, surgeons should consider corrective methods to improve refractive outcomes after surgery. The main strength of this study resides in the large sample size, reflecting real world clinical practice in terms of patient visits, treatment decisions and data collection and allowing for robust epidemiological data and strong statistical power in comparisons. In addition, the large sample was taken from a high-quality data source, regularly used in the UK NOD audits.1 While the sample came from a pool of selected clinics, it appeared to be representative of the general cataract surgery patient population in the UK at that time. Notwithstanding these strengths, we acknowledge some limitations to our study. Only 36% of eyes had postoperative refraction measured and so may not be representative of the entire sample. To investigate this possibility, we examined the preoperative astigmatism and the frequency of complications, co-pathologies and patient age for the 64% (N=70 713) eyes with no postoperative refraction values. These were similar to those of the entire population with regards to average cylinder, incidence of complications, existing co-pathologies and age (data not shown). Keratometry is not commonly measured following cataract surgery in clinical practice in the UK NHS system. Therefore, different measurements of astigmatism, keratometry and refraction were available presurgery and postsurgery in this study, which limited direct comparison of presurgery and postsurgery astigmatism levels. Finally, only regular astigmatism will be amenable to correction at the time of surgery, and determination of regular versus irregular astigmatism requires corneal topography data that was not available to us. In conclusion, there is a significant burden of preoperative corneal astigmatism in the UK population of eyes undergoing cataract surgery that is currently not addressed during routine cataract surgery in the UK NHS system. Residual astigmatism may have an impact on the postoperative visual outcomes and quality of life of these patients and therefore, there is a need to improve access to astigmatism-correcting treatment options during cataract surgery. The authors thank the clinicians who contributed data to the study: Mr Gervase Dawidek from the Barking, Havering and Redbridge University Hospitals NHS Trust; Professor Andrew McNaught from the Gloucestershire Hospitals NHS Foundation Trust; Mr Atul Varma from Mid Yorkshire Hospitals NHS Trust; Mrs Rebecca Turner from the Oxford University Hospitals NHS Foundation Trust; Mr Sumit Dhingra from the Peterborough and Stamford Hospitals NHS Foundation Trust; Mr Imran Akram from the St Helens and Knowsley Teaching Hospitals NHS Trust; Mrs Christina Rennie from the University Hospital Southampton NHS Foundation Trust; and Miss Clare Bailey from the University Hospitals Bristol NHS Foundation Trust. The authors specially thank Christine Bouchet, Aldo Martinez, Leighton Morris and Monia Zignani from Alcon, Shoshannah Kalson-Ray, Melissa Myland and Ian Bonzani from Quintiles IMS, and Christian Martin from Medisoft, for their valued contributions to the study design, analyses and interpretation of the results.
. 2016.Year 1 annual report – piloting of thenational ophthalmology database audit methodology national ophthalmology database audithttps://www.nodaudit.org.uk/u/docs/20/thsumcnchv/NOD%20Audit%20Annual%20Report%202016.pdf (accessed 24 Apr 2017). The Royal College of Ophthalmologists. 2010.Cataract surgery guidelines. Londonhttps://www.rcophth.ac.uk/wp-content/uploads/2014/12/2010-SCI-069-Cataract-Surgery-Guidelines-2010-SEPTEMBER-2010.pdf (accessed 13 Dec 2016).
. Moorfields IOL Study Group MIS. Spectacle use after routine cataract surgery. Br J Ophthalmol 2009;93:1307–12.
. Prevalence of corneal astigmatism in an NHS cataract surgery practice in Northern Ireland. Ulster Med J 2017;86:25–7. Medisoft Ltd. 2017.Medisoft is the UK’s leading supplier of electronic records for ophthalmologyhttp://www.medisoft.co.uk/ (accessed 20 Feb 2017). NHS Health Research Authority. 2017.Determine whether your study is researchhttp://www.hra.nhs.uk/research-community/before-you-apply/determine-whether-your-study-is-research (accessed 24 Feb 2017).
. Power vector analysis of refractive, corneal, and internal astigmatism in an elderly Chinese population: the Shihpai Eye Study. Investig Opthalmology Vis Sci 2011;52:9651. Presented at The results described in this manuscript were presented at the American Society of Cataract and Refractive Surgery Annual Meeting (Los Angeles, USA, 5–9 May 2017) and the Annual Congress of the Royal College of Ophthalmologists (Liverpool, UK 22–25 May 2017). An additional encore poster was presented at the European Society of Cataract and Refractive Surgery Annual Meeting (Lisbon, Portugal 7–11 October 2017). Contributors ACD, MD, MSK, FE, CPV, CM, LZ and DFA were involved in the conception and design of the work. CM and LZ were involved in the acquisition and analysis of data for the work. ACD, MD, MSK, FE, CPV, CM, LZ and DFA were involved in the interpretation of data. CM drafted the manuscript. ACD, MD, MSK, FE, CPV, CM, LZ and DFA critically reviewed the manuscript. Funding This study was sponsored by Alcon (Fort Worth, Texas, US). Competing interests IQVIA received funding from Alcon Laboratories, Inc to conduct this study. ACD and DFA declare no competing interests. MD and MSK were employees of Alcon Laboratories Inc at the time of research. FE and CPV are employees of Alcon Management SA. CM and LZ are employees of IQVIA.